Okage Yokocho’s exclusive taiko drum team, Shinon Daiko, performs throughout the year at the Taiko Yagura, an open air structure in the heart of Okage Yokocho. 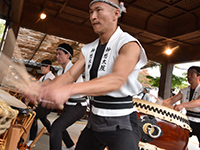 Created in 1992, the same year that Okage Yokocho opened, the Shinon Daiko team conducts high energy drum performances with the spirit of shinon kansha, a thankfulness for nature’s generosity. For generations, traditional Japanese picture storytelling has charmed audiences of all ages. Continuing today, at a time when so much of our information and entertainment is conveyed through technology, the performers at the paper theatre square wish to preserve this simple form of entertainment and the deep connection that happens between entertainers and onlookers through their original materials and love of their craft. Famed wood print artist, Tomikichiro Tokuriki and notable haiku composer, Seishi Yamaguchi both had special connections to the city of Ise during their lifetimes. This exhibition space honors both the artists’ lives and displays some of their most celebrated works. 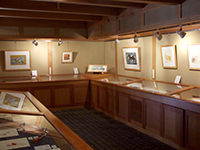 Visitors can purchase wood block prints or other crafts as well as relax in their cafe area while enjoying some wood block artwork. Throughout the year, Iseji Saien displays and sells various kinds of seasonal wildflowers from all across Japan. Visitors can see blooming cherry trees and violets in spring, hydrangeas from May through June, morning glories and Japanese crape myrtles in summer, chrysanthemums and brightly colored Japanese maples in autumn and plum tree blossoms and Adonis flowers in winter. Additionally, local flowers like the Ise chrysanthemums, Ise fringed pinks and Ise irises are on seasonal display. 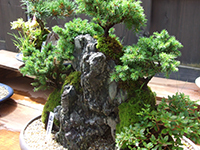 Iseji Saien also offers classes for visitors to become more acquainted with the different types of flowers in Japan. These classes are given in Japanese only. 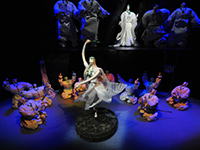 The Okage Theater gives visitors an experiential explanation of Japanese mythology and the important role Ise plays in Japanese history through an animated movie and beautifully constructed Japanese paper figure displays. 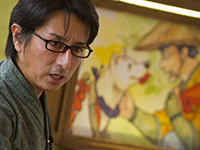 The Okage Theater’s animated movie and exhibits are guided in Japanese only.